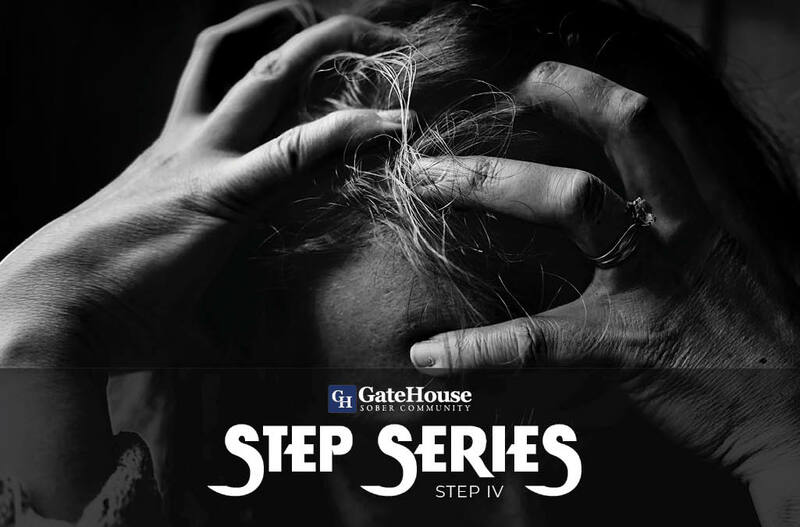 At both GateHouse Treatment and GateHouse Sober Community, whether they’re rehabs in New Hampshire or the South Florida drug rehab, you will find a 12 step plus approach. Be it a drug treatment program or an alcohol rehabilitation center this modality is a blend of clinical services and 12 step immersion. From detox to all the way to the end of clinical services in an outpatient treatment center all staff members work to support the same goal and return to health of the client. All forms of transitional housing that follow like a halfway home, sober house, men’s sober living, or women’s sober living are where a recovery program for true sober living are intentionally designed to harmoniously blend clinical services with spiritual practices that work. Speaking of “work” the first actual work in the program of the 12 steps is the 4th step. Therapists, doctors, nurses, techs, and all staff are supporting the client to acquire the skills needed to find the right sponsor and get to this point in recovery. Until then we are not, “in the program”. Here is a brief overview and summary of the concepts of the 4th step. In the fourth step we finally get to the working part of the program. Spiritual Malady, the third aspect of our disease, gets its first real looking into. Loosely defined Spiritual Malady can be translated to a bad connection between ourselves, others and God (as you understand). Its’ symptoms are unmanageability and disharmony. The Big Book begins its fourth step discussion with the analogy of a business inventory. Every business that does well must know what items they have, what are their accurate value and what items are valueless. It’s suggested we do the very same with our lives. We have already been shown how selfishness is the root of the issue. As addicts, our incessant thought of ourselves created a world where everything and anything could only be seen through the lenses of, “how does this effect me?”. Not a good way to live. This leads any logical mind to then consider the avenues through which this selfishness would bleed into both our lives and the lives of those around us. It appears the glasses of selfishness are comprised of lenses colored by resentment, fear, guilt and shame. We start with resentment. The word comes from Old French resentir – “feel again”. The Big Book explains that the biggest threat to an addict is resentment. Our very lives depend on learning to get free of these. “Oh, I caught a resentment at my homegroup, had to go to another meeting.” He said. We don’t need to have anyone present to catch a resentment. We can do that all by ourselves. If we are having a problem with a step, many sponsors will ask us to back up to the step prior. The third step suggests that we no longer play God. So if we are being poisoned by a resentment we should look at this. By playing God it’s implied that that we know everything, including what’s right and wrong. Many times we have resentfully made judgments against a person or circumstance with false assumptions, missing facts, one side of the story, no sides of the story, or just our irrelevant past experiences and certainly no knowledge of the future. So we JUDGE the person, find them GUILTY, get ANGRY at them, and FEEL that ANGER AGAIN. RESENTMENT to RE FEEL. Anytime we are having a deep resentment we may want to look to what “WRONG” we are reeling from, it may even be a justified one. When we are resentful we are always looking at a person other than our self. It’s God’s place to judge what’s right or wrong. A better scale than “good or bad” for humans to measure each other with would be “healthy or unhealthy”. If we discern someone or their actions as being unhealthy, we can bypass the judgment of bad. It’s the difference between calling a person a scumbag, or just unhealthy. We all make unhealthy decisions, the language of “healthy or unhealthy” allows us to leave judgment to God. The way we measure others is the same way we will measure ourselves. When we fall short, an easy path towards resentment at self, we will want the mercy of calling ourselves unhealthy rather than something more vulgar. We have all had circumstances that we were positive what was happening was wrong, and had it turn out to be to our benefit. Similarly, we have all had a person who did something really harmful to us, that through some divine twist, turned out to benefit us. “Life can only be understood backwards; but it must be lived forwards.”, said Soren Kierkegaard. No place is this more relevant than the Spiritual Path of life. And let’s face it sometimes life is just not fair. People we love are going to die early, others who show no principles will get rich as we struggle financially, the girl who said she would never leave does in horrific fashion. Whatever the source of the resentment, we must me be rid of it. Resentment is always about the past. Whether its an ex who cheated, business partner who stole, or friend turned enemy we have to let go. The weight of resentment ensures that we will sink into the bitter abyss of hatred, loneliness and eventually, active addiction. There is a way out. Just one. FORGIVENESS. “Forgiveness means letting go of the hope for a better past.”, said Lama Surya Das. When we forgive someone no matter what they did, we cut the spiritual tie from them and receive the gift of no longer hating them. This allows us to be more in the present moments of our lives, alive. Some festering resentments can be compared to injuries, whether it’s a gushing flesh wound, an annoying paper cut, or a scab we must allow the ointment of forgiveness to combine with the healing power of time, to allow for the scars of triumph to develop. We can find some suggested prayers specifically for this in the big book. The site http://friendsofbillw.net/twelve_step_prayers has some great prayers from the literature. The 4th step one for resentments is below.